The Minister of Agriculture and Environment, Isabel García Tejerina, has announced that the Torrevieja desalination plant will triple its annual production to guarantee supplies to both the population and to local farmers. The plant that now produces 40 hectometres will increase its output to 120 hectometres thanks to an investment of 45 million euros from central government. 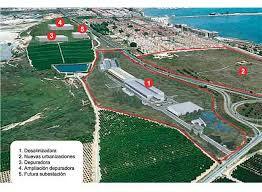 The announcement was made during a visit to the Torrevieja desalination plant by the minister on Monday. She also stressed that the action taken in Torrevieja is just “one of the many that have been made by the current government to ensure the availability of water throughout the Levante region, where investment has now reached approximately 400 million euros.